Thursday was the day I dedicated to taking an initial tour of the exhibit hall and mentally noting games to demo on Friday. For the most part, that's what I did. However, when I saw the Star Trek: Fleet Captains game set up in the WizKids booth, I couldn't resist. While I had known about the Star Trek: Expeditions co-op game, this one had only had vague reports pop up in my rss reader from time to time. This explains why its appearance absolutely shocked me. The game's opening turns were random to a point that almost made me quit, but somehow it all came together into something that I am excited about playing in a way that no game has done for me in far too long. This was easily the highlight of my day. I also demoed another Star Trek game, my less-than-pleased feelings about which you can read here. This was easily the lowlight of my day. On a side note, my long abscence from GenCon had made me forget just how much walking is involved. After one day I would give good money to rent a Segway for the rest of the convention. Also, even a light backpack cuts into your shoulders after wearing it for 10 hours. Geek Chic was showing off a table with an interactive screen built in to ostensibly be used for DMming RPGs. The software wasn't at the level of the Microsoft Surface Settlers of Catan, but it was still interesting to watch. I met up with Philip duBarry, designer of Revolution!, who had contacted me prior to the convention. We chatted for a bit and I signed up for a demo of his new game, Kingdom of Solomon. I'll try that tomorrow. 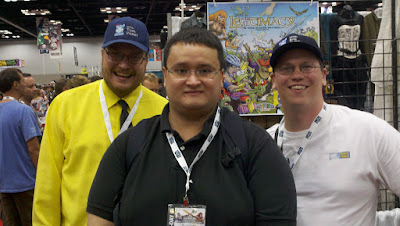 He also introduced me to Tom Vasel and Eric Summerer of The Dice Tower, who happened to be right behind me at that moment and gave me a badge ribbon for the Jack Vasel Memorial Fund. Philip mentioned my blog to Tom and he asked me about it and my game design efforts. I appreciated Philip helping me network like that. I also headed over to the Tasty Minstrel Games booth to meet up with Seth Jaffee. This being Thursday, he was very busy demoing to people at the booth, so I told him I would swing by when it was less crowded. I have a Titans of Industry change kit to bring his copy of the prototype up to the latest version. It looks like I'll be able to get a playtest together Saturday night, so I'll make sure that goes well before giving the changes to Seth. Finally, I stopped by Z-Man's booth to say "hi" to Paul Girardi and Zev. I won't have anything to pitch Z-Man for awhile, but Zev is nice (he was the first publisher I ever pitched to, with my awful Programmer: Battle for Bandwidth game half a decade ago, and yet he still speaks to me despite the criminally poor design of that game) and I want to keep the lines of communication open. I'm a little dissappointed, i thought Tom Vasel was like 6'6" ? Maybe I'm taller than you think.